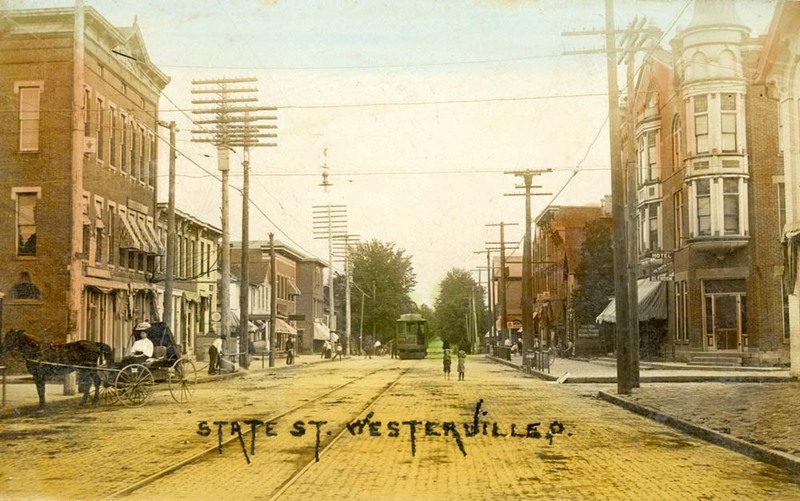 The first Interurban railroad in Columbus was the line to Westerville which commenced service August 25, 1895. Planning for the line started four years before with community meetings and fund raising. Construction began in 1893 on Cleveland Avenue at Mt Vernon Avenue where the Columbus & Westerville Railway, as it was known, met the Columbus Street Railway Co. Like the Columbus streetcar system the Westerville line was wide gauge, 5' 2". In 1894 a powerhouse and car barn were constructed along Cleveland Avenue, they were located between East First and Reynolds Avenues. Before it ever started operation the Columbus & Westerville Railway Co. was acquired by new interests and named the Columbus Central Railway Co. Newspaper articles refer to the company as the Columbus Central Street Railway Co., Columbus Central Electric Road, and the Columbus Central Railroad Co. It would appear that the Columbus Central Railway Co. was the correct name until the line was acquired by the Columbus Railway & Light Co. in 1900. With its integration into the Columbus streetcar system it became known as the Westerville Line. It was also referred to as the "Green Line" due to its green interurban cars. From Cleveland and Mt. Vernon Avenues the line proceed north on Cleveland Avenue to what is now the village of Minerva Park. The line turned east crossing Huffman farm which would be developed into the Minerva Amusement Park. On the east side of Minerva Park the line crossed the Cleveland Akron & Columbus Railroad at grade. It again turned north running along the east side of State Street (State Route 3) to Westerville. The line ended in a two track car house at County Line Road on the north side of Westerville . At the Columbus end the CCR Co. cars entered Columbus Railway & Light Co. track at Mt. Vernon Avenue. According to the History of the City of Columbus Ohio to year 1920 the CCR Co. had a franchise to operate the Westerville car "by various streets to Spring, thence to Front, thence north on Pennsylvania Avenue to Fifth Avenue and south on Front, east on Livingston and south on Parsons to south corporation line." It doesn’t seem likely the Westerville car actually went as far as south Columbus. Schedules for 1907-1912 show the Westerville car starting its northbound trip from South High and Town Streets. It would travel north on High St., east on Spring Street, north on Neilston Avenue east on Mt. Vernon and north on Cleveland Avenue. There was a small freight house on the northeast corner of Cleveland & Mt. Vernon Avenues used by the Westerville freight motor as well as the Columbus, New Albany & Johnstown Traction Company's freight motor. The 1907-1912 schedules show the passenger car ran hourly with the car leaving Town and High Streets at 5:30 am and every hour thereafter with the last car leaving at 11:30 pm. The freight motor made three round trips each day. The crown jewel of the early interurban years was the Minerva Amusement Park. More on Minerva Park can be found on the Minerva Park page. In 1929 the line was abandoned north of Minerva Park, replaced with bus service. In 1930 the now streetcar line was cut back further. In 1933 the Cleveland Avenue streetcar line was replaced with Columbus' first trolley coach line.